On this day in Duluth in 1889, construction began on a new fire house on Minnesota Point to serve the neighborhood of Park Point. According to Duluth Fire Department historian Jarry Keppers, The two-story, wooden frame building with one stall that had a double-type front door was named Engine House No. 5; the structure and property together cost $3,600 (about $97,000 in today’s dollars). Keppers writes that the hall was “built by the firefighters under the supervision of Captain Edward Jackson[and] housed Chemical Engine No. 5 which was a Babcock chemical engine weighing 5,500 pounds and was drawn by two horses. This piece of apparatus was manned by four men.” This horse-drawn engine couldn’t have worked well on Minnesota Point at the time, as Minnesota Avenue was little more than loose sand and, beginning in 1889, a streetcar line. 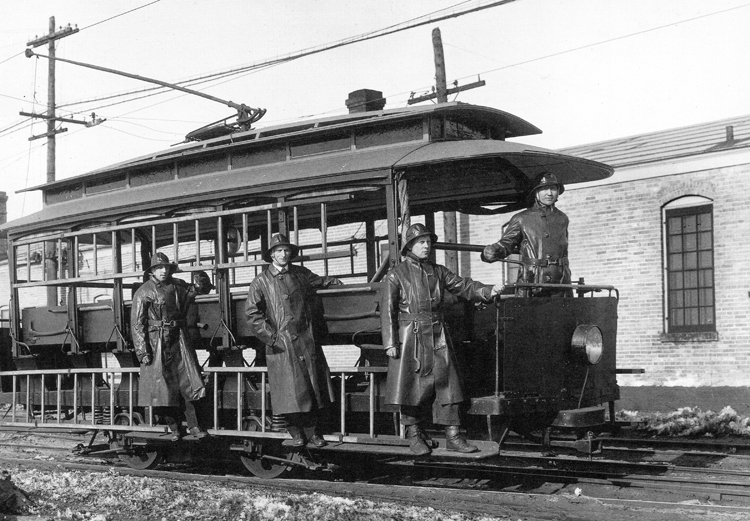 So, according to Minnesota streetcar historian Aaron Isaacs, the city purchased a streetcar from the Interstate Traction Company, which operated the Park Point car line, and refitted it for firefighting. Equipped with ladders, extinguishers, a water pump and 1,500 feet of hose, the car became “North America’s one and only firefighting streetcar.” Since the fire station had just one firefighter, a streetcar company employee drove the rig and, according to Duluth streetcar expert Wayne C. Olsen, it was the “moral obligation of any male citizen along the way to jump on the [fire] car to offer whatever assistance was needed.” Minnesota Avenue was paved in 1915, and Engine House #5 was replaced in 1931 with a new structure at 2140 Minnesota Avenue designed by A. Reinhold Melander. At the same time fire-fighting streetcar was replaced with a conventional fire engine. Despite the concerns of Park Point residents, the city closed that fire hall in 2012, and the building has been renovated into a private residence.